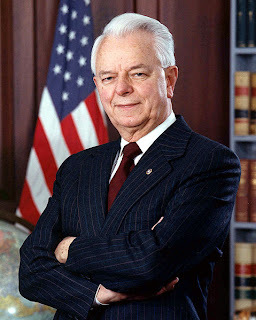 UMP | University of Minnesota Press Blog: Sen. Robert Byrd's legacy may be complicated, but one thing is certain—he won't be easy to replace. Sen. Robert Byrd's legacy may be complicated, but one thing is certain—he won't be easy to replace. Today's post is by Rebecca R. Scott, assistant professor of sociology at the University of Missouri and author of the forthcoming Removing Mountains: Extracting Nature and Identity in the Appalachian Coalfields (September 2010). There was a universal acknowledgment of the service this powerful senator had offered his poor home state over the years. It’s easy to mock the numerous pork barrel projects he brought home; as some wag tweeted, “Who will be the first editorial cartoonist to depict St. Peter welcoming Byrd to the Robert C. Byrd Pearly Gates?” But West Virginia loves Sen. Byrd, and it was hard not to mourn his death, even knowing full well the extent to which his career served the interests of big coal. As with many skillful politicians, Byrd’s personality—the Shakespearean oratory, the down-home fiddle playing—seemed to outweigh his politics. When he recently dressed down Massey Energy CEO Don Blankenship in the senate hearings on the Upper Big Branch mine disaster, it was a cathartic scene for those of us used to seeing the coal baron operate with apparent impunity. But for West Virginians who have known him their whole lives, all of that was merely interesting; above all, Byrd was a great senator. But what, exactly, does that mean: “a great senator”? Born into a poor family, his adoptive father was a coal miner, and he grew up in a small coal company house. Mostly uneducated until adulthood, he was a lay minister whose fundamentalist sermonizing gave him a following, and probably provided the inspiration for a career in politics; certainly it is possible to hear echoes of those fiery sermons in Byrd’s speeches in the Senate. A brief stint in the Ku Klux Klan won some local elections, but those ties had to be severed of course by the time he ran for the Senate. It was his 14-hour filibuster of the 1964 Civil Rights Act that really stands out, though. He later apologized for being a Klansman, he supported Obama in 2008, and overall, he seemed to leave the most apparent of his prejudices behind. Unlike his colleague Ted Kennedy, Byrd’s patrician status was hard won, hard scrabble. His racism never entirely disappeared; his autobiography notes that in his eyes, the poor whites of Appalachia are the original model minority—hard workers who don’t expect something for nothing. His pride in his Euro-American heritage was always under the surface of his famous oratory that made him so notable in the senate. Quoting Shakespeare, Greek philosophers, and the Constitution performs a claim to the ideology of the superiority of Western Civilization, order for its own sake, and detached reason. That’s why, despite his own strong stance against the war in Iraq, he summarily dismissed the Code Pink protesters from the Senate floor. The demonstrators challenged the sanctified airs of the senate, where opposition to war is best delivered in the lofty terms of Cicero, not with the visceral passions of disorderly civil disobedience. If Byrd represented West Virginia in this privileged scene, he won’t be easy to replace. For more information about coal country lives in southern West Virginia, check out Scott's book Removing Mountains: Extracting Nature and Identity in the Appalachian Coalfields, which will be out this September. Removing Mountains will be UMP's first Quadrant book. You said it well Becky. He was quite a presence, but who did he really help? Why is one of the most beautiful states in the Union, having been represented by such a powerful man, still suffering exploitation, poverty, and obesity in mass? Why is such a beautiful place under threat of extinction? Why is such a beautiful place, so near to Washington, enjoyed by Washington, and yet so vulnerable to Washington?